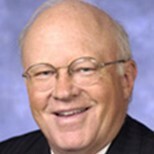 Ken Blanchard is a global business consultant and sought-after author and speaker. He is characterized by friends, colleagues, and clients as one of the most powerful and insightful individuals in business today. When Ken speaks to an audience, he speaks from the heart with warmth and humor and communicates with each person as if they were alone together. Ken is a polished storyteller with a knack for making the seemingly complex easy to understand. His best-selling book, The One Minute Manager, co-authored with Spencer Johnson, has sold more than 9 million copies worldwide and has been translated into more than 25 languages. The story, which demonstrates practical management techniques, is about a young man in search of world-class management skills. Ken earned his bachelor’s degree and Ph.D. from Cornell University, where he is a visiting lecturer and trustee emeritus of the board of trustees. He earned his master’s degree from Colgate University. Ken is Co-Chairman and Chief Spiritual Officer of The Ken Blanchard Companies®, which energizes organizations around the world with customized training and bottom-line business strategies. Situational Leadership® II, codeveloped by Ken, is the company’s core management training program and is among the world’s most practical, effective, and widely used leadership programs on the market today. ions to business needs around the globe. Ken’s awards and honors for his contributions in the field of management and leadership include the Council of Peers Award of Excellence from the National Speakers Association and the Toastmaster International’s Golden Gavel Award. He has been a guest on numerous national television programs, including Good Morning America and the Today Show, and has been featured in many popular publications such as Time and People. • Catch people doing things right. • Don’t wait until people do things exactly right before you praise them. • If God had wanted us to talk more than listen, He would have given us two mouths rather than two ears. • The fastest way to drive an employee insane is to give him or her new responsibilities and fail to provide the necessary instruction and train-ing to do the job. • Leadership is not something you do to people. It’s something you do with people. • As a manager the important thing is not what happens when you are there, but what happens when you are not there. • Leaders help ordinary people achieve extraordinary results. • The first principle of ethical power is Purpose. By purpose, I don’t mean your objective or intention—something toward which you are always striving. Purpose is something bigger. It is the picture you have of yourself—the kind of person you want to be or the kind of life you want to lead. The quickest way to get started with Ken Blanchard is to read The One Minute Manager, a #1 national best-selling phenomenon. It is an easily read story that demonstrates three practical management techniques for improving management effectiveness and employee productivity. The book is short, the language is simple, and the system works. The One Minute Manager is valuable for both employees and employers. Employees look to their bosses for praise and for the message that their work is meaningful. Bosses are concerned with performance, the work process, or any number of issues that stem from leading a team. This book helps guide everyone through the critical process of communicating objectives. When you follow the advice in the book, you’ll be able to give praise or reprimands, set goals, and do much of the work that successful management requires. The One Minute Manager has inspired thousands of leaders and ranks as one of the most successful management books ever published.